I expected my arrival in Vietnam to be a rush. The country worked its way under my skin when I first visited four years ago and now represents the beginning of my big overseas trip – tangible confirmation that I’m really on my way around the world. Stepping into a wave of humid air outside of Saigon’s Tan Son Nhat airport, I waited for the rush to hit me. Instead I felt tired. Excited too, but mostly just tired. Unable to sleep on the plane, 20 straight hours of traveling had worn me down. We left San Francisco at 1:20pm on Thursday and didn’t land in Saigon until 10:15pm on Friday. I’d been worried about my Vietnam visa but it turned out to be no problem. Vietnam requires U.S. citizens to have a visa to enter the country, and – unlike in many other countries – you can’t just get one when you arrive. You need to arrange the visa before you get there, usually through the Vietnam embassy in the U.S. Instead I was trying a variation of the visa-on-arrival, where I paid a Vietnam-based service $20 to file a request that would let me pick up my visa at the airport. It seemed a little sketchy, but by using that approach I didn’t have to mail my passport anywhere and I could wait longer before specifying my arrival date. It worked perfectly, despite the fact that I arrived a day late and didn’t have a return ticket. Getting my visa and breezing through customs took no longer than 20 minutes. My first experience of Vietnamese hospitality happened before I even left the Hong Kong airport. A fellow passenger named Ailien struck up a conversation as we waited to board our flight to Saigon. Turns out she was born in Vietnam and currently lives in Saigon, but she’s a Fulbright Scholar who went to school at Berkeley and spent many years in the U.S. When she heard my story, Ailien offered a lot of helpful advice and said I could crash on her couch. It didn’t seem right to impose on her place, but I did meet up with her for a great dinner at a local noodle restaurant the next night – in other countries it’s always more fun and interesting to hang out with the locals. Thanks again Ailien! Saigon has undeniable energy, but huge, crowded cities just aren’t my thing. By 10am on my first morning I’d already stopped by the Sinh Café to buy the “Open Tour” bus ticket that will take me up the coast to Hanoi, stopping at a series of beach towns along the way: Mui Ne, Da Lat, Nha Trang, Hoi An, and Hue. Three nights in Saigon would be enough so I booked my first bus for Monday morning. Not too long ago I would have forced myself to check out the same popular tourist attractions I dutifully visited four years ago – the War Remnants Museum, Reunification Palace, the Ben Thanh Market… But I’m getting better at giving myself permission to skip places that don’t particularly interest me. I did attempt a mostly random walking tour that was interrupted by a sudden downpour, and I really enjoyed the time I spent huddled under a storefront awning as I watched the city casually adjust itself to the rain – thin plastic ponchos popping up on the brave few still speeding their motorbikes through the streets, construction workers joking with each other under the cover of a bright orange tarp, children retreating further into their homes to monitor the rain through open doors while they finish their bowls of pho. On my last day in Saigon I realized I hadn’t taken a single photo yet. Lacking inspiration, I decided to at least get a documentary shot of my hotel, in the backpacker-oriented Pham Ngu Lao area. Hopefully it gives a sense of the constant chaos on the streets. He pointed at me and shouted, “No girlfriend! Ha!” Then he walked away with a big smile on his face. Hey, Thanks for mentioning about me in your blog. If everyone, I meet and help a little bit, would post the story on the internet like you, I'll be internet celebrity. Haha. Thanks, Rob. Bon Voyage! 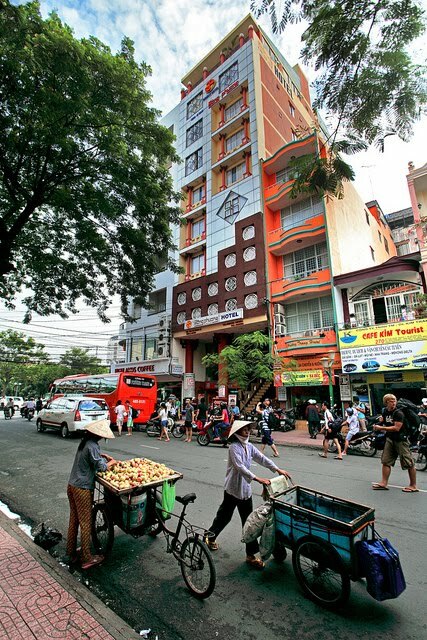 Saigon isn't my fave city either – I skipped all of those sights the first time around and I think I'll skip them again! I think the trip is about doing what you want, not what you ought to do, so it's great that you've realized that! I love that Asian humor! I got so many comments in Malaysia – “you're alone? aren't you sad?” – at least this was funny! O! And Ailien seems really sweet for offering to let you in and also for going to dinner with you! Can't wait to hear about who else you meet along your way. O! And Grandmom and I were talking about Jake today and I started missing you and Jake.. Our sweetheart who we all miss soo much!